Learn the basics of Indian Classical Music at your own pace - just listen and sing-along. This blog is dedicated to music lovers from all over the world. We expect this blogspot to be a favorite destination for the students of Indian Classical Music. Here, we present audio resources teaching the basics of various Raagas in Indian Classical Music. Just listen and sing along. Please go through Things Good to Know page to get the basic understanding of terms used throughout this blog site. Please visit the List of Raagas page. Click on the name of any Raag which will take you to the learning material on that Raag. We will keep upgrading the material on this blog as we progress. Ideally, it is good to learn singing directly from a Guru who can direct you to sing in tune(Sur) and rhythm(Taal). However, in today's fast paced world there are many challenges to overcome while learning music. This blog is an effort to make those challenges easier. We hope it serves this purpose. We are happy to let you know we have added AalapTane for the following Raagas (and will be adding more....) Asavari, Bageshree, Bhairavi, Bhoop, Bhimpalasi, Bihag, Des, Durga, Darbari Kanada, Hamir, Kafee, Kedar, Khamaj, Malkauns, Piloo, Sarang, Tilang,Yaman. Just go to "List of Raagas"and Click on the name of the Raaga and scroll down to see AalapTane post. Also Notations for Swarmalika is given in the Notations column of the List of Raagas table. If you visit raagabasics on youtube.com you will be able to find the audio post directly. e.g. Raag Kedar AalapTane or swarmalika etc. Thank you for visiting our blog. We welcome your comments and suggestions to make this blogspot better. Thank You & Happy Singing! This is a glossary of terms used in Indian Classical Music. You will hear these terms at times in the audios on this blog. A thorough understanding of these concepts is a prerequisite for learning Indian Classical Music. On this blog, we are not going to delve deep into these theoretical aspects of Indian Classical Music. This blog is only for the music students, novices and beginners. Hence, we will spend more time on actual lessons and practical aspects of singing. Definition of Swar: Swar is nothing but a musical note. There are seven Standard Notes in Indian Classical Music as given below. We call these notes as "Shuddha Swar". Shuddha Swar: Sa Re Ga Ma Pa Dha Ni. They are also called Shadja, Rishabh, Gandhar, Madhyam, Pancham, Dhaivat and Nishad respectively. Komal Swar: Out of these seven swars, Re Ga Dha and Ni become "Komal" when their frequency is lower than their Shuddha form. Their place on the keyboard or on harmonium is one note previous to their Shuddha Swar's note. We denote komal swars on this blog by marking a (k) in front of them. Teevra Swar: Among the seven basic swars, only one, that is, Ma becomes Teevra when its frequency is higher than its Shuddha form and its place next to its Shuddha swar's place on the keyboard or on the harmonium. We denote teevra swars on this blog by marking a (t) in front of them. Notation Used on This Blog for denoting different Swar: In the notations we have used on this blog, we are showing Komal swar by marking (k) and Teevra by marking (t) next to the swar's symbol. Saptak: is a group seven prominent notes on a keyboard or harmonium. There are three main Saptaks on a harmonium. The lower saptak is called Mandra or Kharjaa Saptak(which is the group of seven prominent notes in the left most part of the harmonium), the middle Saptak is called Madhya Saptak(which is the group of seven prominent notes in the middle part of the harmonium) and the upper Saptak is called Taar Saptak (which is the group of seven prominent notes in the rightmost part of the harmonium). On this blog, we are using capital letters to show the swars from Taar Saptak where the frequencies are higher than normal or Madhya Saptak. We are showing small letters to show Mandra or Kharjaa saptak (frequencies are lower than normal or Madhya Saptak). A cycle of 12 beats for Thaay Laay (slow rhythm). A cycle of 16 beats for Thaay Laay (slow rhythm). Taal can be used at varying speed based on the requirement of the singer. 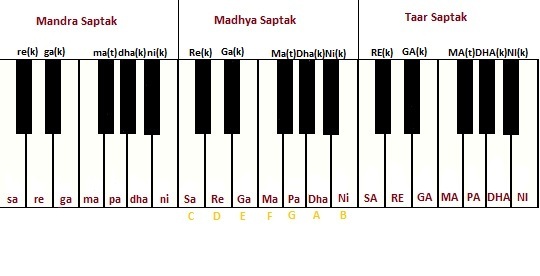 We are using Madhya Lay Taal (Medium Speed Rhythm) for almost all the lessons. Definition of Raag: is presented by an artist using the following 4 things in the rhythm chosen by the singer. 2) How those swars are used in ascending structure which is called as Aaroh and in descending structure which is called as Avaroh. 3) The most prominent swar in the Raag is called Vaadi (वादी). Second most prominent swar in the Raag is called Samvaadi (संवादी). 4) The Mukhada (face) or Pakad is a cluster of a few notes by which Raaga is recognizable.